If you're visiting the Caves of Narshe, we assume you've seen a moogle or two in your time. We're not going to insult you by explaining that they're cute and cuddly and ooh, we just want to hug one up right now okay bye. Ahem. In Final Fantasy IX, moogles are avid correspondents, sending mail worldwide with gossip and current events. You come in as an unlikely courier, which exposes you to the land of moogles. You can also read on to learn what to do with your Kupo Nuts, and how to keep in touch with Stiltzkin throughout the game. At no point in the game is doing the Mognet quest required. However, should you be interested in delivering every letter, you need to start early and watch for moogles, because it's easy to proceed too far in the plot and miss out. Sometimes, there are even letters that don't involve you at all, and those are not listed below. 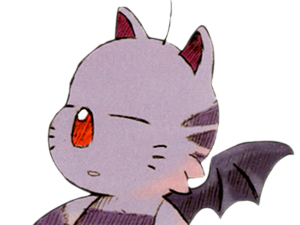 Moguta is a moogle in Gizmaluke's Grotto who really loves Kupo Nuts: if you give him a Kupo Nut, you will get an item in return. With Moguta is Mogmi, Moguta's new husband, but she doesn't share her spouse's fervor for the nuts. The first time you meet them, Moguta will be trapped in a bell. Vivi will give Mogmi a Kupo Nut that he received in a previous ATE, so Moguta can break free. This will get the party the Holy Bell, and will also provide the opportunity to bring back more nuts over time. Moguta will give you one item per Kupo Nut delivered. Remember this, though: you can never have more than one Kupo Nut in your inventory. If you have one in your inventory when you deliver a letter, you won't get the nut for delivering that letter, and you'll have no chance of getting it from that moogle later. There's no in-world reason that's ever given for the inability to carry more than one; it's just some RPG punishment. Essentially, this means that if you want to max out this sidequest, you will need to find your way back to Moguta after every letter delivery, or you'll have to put off the next delivery until you can. The first delivery, as mentioned above, gives you the Holy Bell. On Disc 2, you will get an Elixir. Disc 3 is good for an Extension. Disc 4 is the one place to get the last Aloha T-shirt! Doing the Kupo Nut on Disc 4 is the only way to get that last Aloha T-shirt into your inventory (the rest come from chocobo-related work. Stiltzkin is a nomadic moogle with whom you can interact over and over during the course of the game. You can often buy items and other things from him, and he will continue his journey to a new location after you do so. If you buy from him at every opportunity - and you should - you will receive a reward later. Additionally, his items tend to be cheap and are sometimes rare, to boot. Finally, here's something interesting: Stiltzkin will never tell you "kupo!" Stiltzkin also sends out a lot of mail, but you won't be asked to deliver anything for him - he's more than capable of doing it himself. If you purchase each time, speak to Stiltz again after handing over money on disc 4. You'll receive a Ribbon in gratitude. This is Mognet Central, the place where letters come and go. You will realize thereâ€™s a problem after talking with the few Moogles that are in here. They say the machine stopped because they need a certain item. If you've been following the moogle letters and sidequest as well, then you probably caught wind of the problem (and some idea of what caused it) before ever even stepping foot in Mognet Central. That being said, you needn't be following that sidequest to do this! You can only fully solve their problem only you've reached Disc 4, though it can be kicked off the chain of deliveries leading to the end earlier if you've kept up with delivering every letter. To start, head to the steeple in Alexandria and talk to Kupo. He will mention that he thinks the mystery of Mognet Central is nearly solved, and will then ask you to deliver a letter to Atla in Burmecia. Atla will be where he has always been, in the Vault. Give Atla the letter, which will trigger a chain of further letters around the world. Start by going to Mogryo in Black Mage Village, then Kumool in Ipsen's Castle, then Mois. If you're looking for Mois in Disc 3, you'll be looking in the Ice Cavern, but if you are in Disc 4 by now, you'll have to take Quina and get to Fossil Roo's entrance. Talking to Mois after delivering the letter will get you a letter to Noggy in Daguerreo, who will in turn send you right back to Kupo with one last letter. Upon receipt, it will all become clear to Kupo - what he's missing is Superslick! Of course, poor Kupo has no idea where to get any. Now, one could go searching around for a while looking for it, but you're at CoN. So we'll tell you to just find Ruby at her mini-theatre. She'll hand it over, and then it's back to Mognet Central. Once you're back, take the Superslick to Artemicion and hand it over. Mognet Central will fire back up and you'll get a Protect Ring for all your running. You'll find out exactly what happened, and then Stiltzkin will show up and become a quantum Moogle, existing both at Mognet Central and Alexandria for the rest of the game. That will be the end of your letter quest, because Artemicion is back on the case. After this point, Mosh will also tell you how many letters you managed to deliver through the game when you speak to him. One final note: you'll get some Kupo Nuts while running around for this part of the quest. Take them to Moguta as desired, but note that the one you can get from Kupo will be the last you can get in the game. You can hold on to it if you're sentimental. Many Moogles monitor masterful Mogshops with multitudes of mitems... I mean items. These are separate from what Stiltzkin can do, and among the Moogles who run shops are Atla, Mogki, Kuppo, Morrison, Mimoza, Mojito, and Kumool. Their shops' wares can be found at our Stores and Maps page and in the Walkthrough.